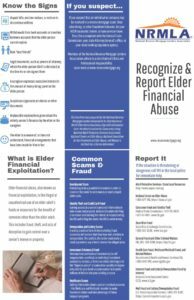 WASHINGTON (June 15, 2018) – The National Reverse Mortgage Lenders Association is proud to participate in World Elder Abuse Awareness Day today with the release of a new consumer brochure, Recognize & Report Elder Financial Abuse. The free tri-fold brochure, available for download from NRMLA’s consumer education website at https://www.reversemortgage.org/ReportFraud, helps seniors, and their loved ones, avoid common scams, spot signs of elder fraud and exploitation, and stop and report wrongdoing. Each year, an estimated five million, or one in ten, older Americans are victims of elder abuse, neglect or exploitation. According to the National Center on Elder Abuse, the annual financial loss by victims of elder financial exploitation was estimated to be $2.9 billion in 2009, a 12 percent increase from 2008. Common signs highlighted in NRMLA’s Recognize & Report Elder Financial Abuse brochure include unpaid bills, eviction notices, or notices to discontinue utilities; withdrawals from bank accounts or transfers between accounts that the older person cannot explain; new “best friends;” legal documents, such as powers of attorney, which the older person didn’t understand at the time he or she signed them; and a caregiver who expresses excessive interest in the amount of money being spent on the older person. If the situation appears threatening or dangerous, NRMLA advises readers to call 911 or the local police for immediate help. World Elder Abuse Awareness Day was launched on June 15, 2006 by the International Network for the Prevention of Elder Abuse and the World Health Organization at the United Nations. WEAAD aims to provide an opportunity for communities around the world to promote a better understanding of abuse and neglect of older persons by raising awareness of the cultural, social, economic, and demographic processes affecting elder abuse and neglect.